Our teachers are Ms Blackledge (mornings) and Mrs Parkinson (afternoons); our SSAs are Mrs Grogan and Mrs Yim. It's been another very busy week for 6BP! We've been working extremely hard and have had a full rehearsal for SATs week. The children have done extremely well and have been rewarded for all their efforts with a pizza party which we had on Thursday afternoon. Please encourage your child to look at our online resources and have a go at some of the songs and games to help prepare them for the forthcoming assessments. Many thanks to the parents who attended this week's Waddow Hall meeting - I am aware that there is an issue with the dates for those children who are going on the Waddow Hall residential and who are also due to attend the sampling days at Walton Le Dale High School on the 27th and 28th June. Please be assured that we are working with Walton Le Dale to ensure that alternative arrangements can be made for these children. As always, if you have any questions or concerns, please do not hesitate to contact either myself or Mrs Parkinson. What a busy start to the new term Class 6BP have had! We have been working really hard preparing for the SATs assessments which are just around the corner. The children have worked extremely hard and should be really proud proud of all the progress they have made so far. Can we please remind parents that at this time of year, it is particularly important that children get lots of sleep, that they're at school on time every day and that they play some of the online games on our class web page to keep their basic skills going. As always, if parents have any questions or concerns about the run up to the SATs or SATs week itself, please feel free to contact either myself or Mrs Parkinson. Alternatively, please refer to the video further down this page for additional help and advice on supporting your child through the assessments. Many thanks to all the parents who have emailed or sent photos in for the Extreme Reading Challenge. The winners will be announced in Friday's assembly - watch this space! As we make our way into the final week of the Spring Term, we are starting to think towards the first half of the Summer Term and the SATs assessments. We have been doing lots of work in class to make sure that we are fully prepared for the assessments when they arrive (we will be sitting them the week beginning 14th May) whilst making sure we do plenty of non-SATs work such as music, art, PE, science and history. We are very aware in school that, whilst the SATs assessments are very important, it is essential that children's school life is balanced and not focused solely on passing tests. If you have any questions about the SATs themselves or how to support your child both before and during the assessments, please do discuss these with myself (Ms Blackledge) and Mrs Parkinson at Parents' Evening (Wednesday 11th April). Alternatively, if you feel you need longer to discuss the matter, please arrange to see us at a different time when we will be more than happy to help in any way that we can. Our class page is updated regularly and you will find plenty of games and activities in the Online Resources section of the page which children can access to keep their key skills going over the holidays and which are a fun way to prepare for the assessments. Your child will have brought home a letter regarding the Extreme Reading Challenge which is being held in school to promote reading and help to relaunch the school library. Please support your child by encouraging them to read and taking a photograph of them reading in an unusual and creative place. A winner from each class will be selected and a special prize will be given to the overall winner. Good luck! May we take this opportunity to wish you and your family a very happy Easter - we look forward to seeing all of the children back at school on Monday, 9th April! After the excitement of a snow day and World Book Day last week, we are again working very hard. Last week was assessment week in class and we sat the 2017 SATs papers to help prepare us for the real thing in May! The children gave 100% and did really well with the various assessments - we will be letting parents know how they got on at parents' evening which will now be held early after the Easter holidays (we will give the new date in the near future). This week, we will be working through the children's papers from last week and discussing what we did well as well as working through any mistakes to ensure children learn from the assessments and improve in the future. Many thanks to those parents who supported World Book Day and sent the children to school in costume - the day was a big success and the children produced some beautiful work as a result. Please have a look at the 'Our Fabulous Work' section of our class page to see some examples! Could we please remind parents of the importance of children arriving at school on time, having good attendance and also having a good night's sleep; some children are coming to school very tired and this is having a negative impact on their learning. The last week of the half term is upon us and already we're into February! This week (Tuesday), we will be taking part in Safer Internet Day and learning all about how to stay safe online. Please help to support your child in staying safe by looking at the resources below and talking to your child about their internet usage. We want the children to enjoy a well-earned rest over the half-term holiday, however, it is vital that they continue practising their skills in maths and English in short bursts. Could we therefore ask that you ensure your child is reading daily and that they have a go at some of the maths games on Class 6BP's page - this will really help them to improve and ensure that they don't go rusty over the break! Could we remind parents and carers that children should be coming to school in full school uniform which includes a pair of sensible school shoes. We do not allow children to wear trainers in school as these often are not water resistant, do not provide proper support for children's growing feet and are not part of our school uniform. We hope that you and your child enjoy the half-term holiday; don't forget, school reopens at 8.40 am on Monday 19th February! What did you notice about the relationship between Macbeth and Lady Macbeth: who was in charge? How did Macbeth and Lady Macbeth deal with the guards? Why did the guards not suspect what was about to happen? How did Macbeth feel when Duncan spoke to him? Check out our 'Fabulous Work' page for photos of each group's freeze frame! 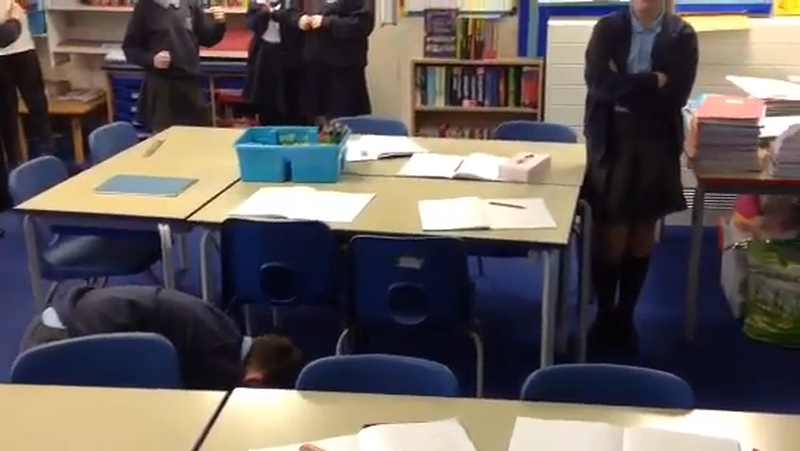 Whole class re-enactment of King Duncan's murder.